There is good reason to look up!! Today’s ceilings are a lot more elaborate and have more architectural design than in years passed. A great ceiling design whether it is in the living room or the dining area, the kitchen or the bedroom, can give a room unique and individual character leaving quite an impression to all who enter. There are countless patterns, designs and colors to choose from. From a tray ceiling to beam ceilings, a cove ceiling to the highly popular drop ceiling, coordinating your lighting with these unusual ceiling patterns can give your home a dazzling look. These very popular mica pendants of the Laguna Collection are an addition to the Quoizel Naturals Collection and feature a mosaic tile stripe, which appears to be floating around a taupe mica shade. The coppery shimmer tiles coordinate with the ceiling and add a touch of elegance to this space. A rustic contemporary look that gives a dramatic flair to your home, theKyle Collection serves as a piece of art in itself. 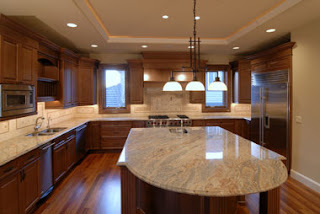 It features gorgeous butterscotch onyx shades that accent the architectural design of the ceiling emitting a romantic glow for a traditional and refined look. If you have a modern-style ceiling that has grooves or canals running through it, adding recessed lighting along with a decorative fixture not only provides adequate lighting to the area but also highlights the unique architectural feature of the ceiling. Featured here is Quoizel’s Genova Collection. The pretty design is inspired by the Italian port city of Genova, and its twisted glass and dual finish of burnished copper and ombra go well with the ceiling design drawing your eyes upward. To see these and many other collections, go to Quoizel to coordinate your decorating decor and lighting! Visit Lighting Specialists to buy now!